I’m a Norwegian woman who’s spent the day dreaming about all the great pictures on your website. So many fantastic pictures! I’ve found nothing like it in Norway. I particularly fell for one and was incredibly disappointed when I realized that you only ship pictures inside the United States. So, of course, my question is if it may be possible to ship a picture to Norway if I pay for shipping myself? I would really really appreciate that! The picture I like so much is “Bad Homburg Spa Park” by Barbara Mierau-Klein. 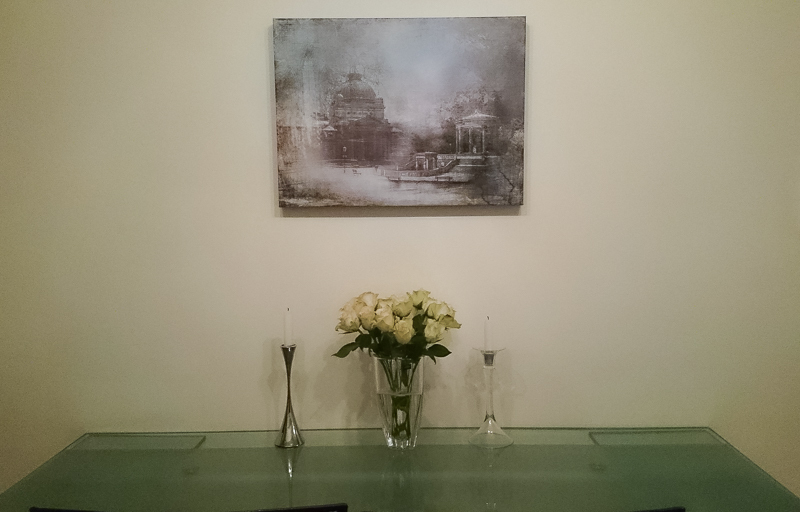 So what could we do to get this canvas print to our client in Norway? First, Mike contacted ArtBoja contributor Barbara Mierau-Klein. I reached out to the artist… and guess what? She was planning a trip to Norway in 3 weeks, so I got her connected with Mette. 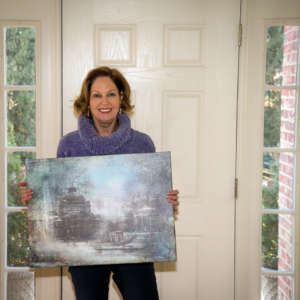 Barbara ordered the print from ArtisanHD, had it shipped to her house in the US, then took it with her and hand delivered her creation to her customer in Oslo. Now that’s service! What did the artist have to say about the experience? Image successfully delivered! Everything worked out swimmingly. 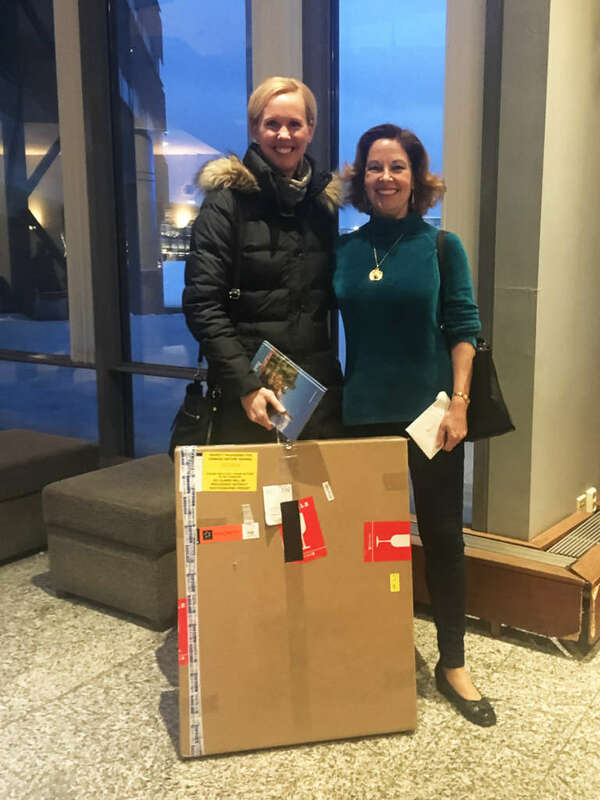 I met Mette at the airport hotel in Oslo, where I was overnighting before my flight up North to the Lofoten, and she took the picture home with her and is very happy with it. Here are 2 photos, one of me with the image, and one of Mette and me with the box being transferred. What was the inspiration or story behind Bad Homburg Spa Park? 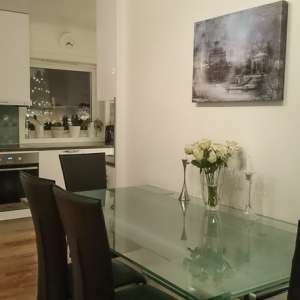 For the past five years I have been spending part of the year in Bad Homburg, a charming small town of 50,000 inhabitants just outside of Frankfurt. As an avid photographer, I started exploring the town with my camera and actually ended up publishing a photo book about it last year. With the many images I had in my files, I just started playing with some of the building images from the beautiful Spa Park, and gave them a sort of vintage look in tune with their character. And then things developed a momentum of their own! As so often happens with digital art, and I ended up blending two buildings together in a collage with a lot of additional elements and some lighting effects. I have been thinking about playing with the many other building images, maybe of the town’s castle and its White Tower, to create a matching image – a project for the future. 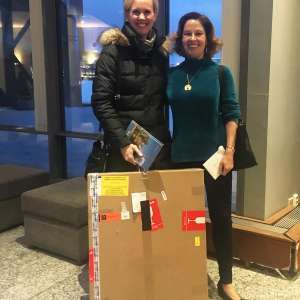 It’s so great that you could hand deliver your work to Oslo! What brought you to Norway? By lucky coincidence the client inquiry came just 2 weeks before I was setting off to Norway myself. I was on my way to a photo trip to the very North of Norway, to the Lofoten Islands to photograph landscapes of snow-covered mountains and fjords and hopefully some Northern Lights. The plan was to overnight in Oslo and fly out the next morning on the small plane taking me up North. 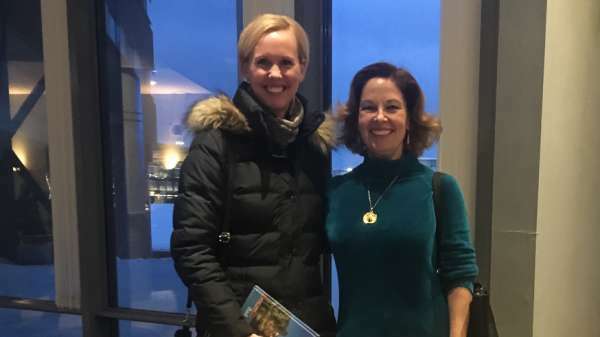 Lucky coincidences continued and it turned out that Mette, my client, lives in Oslo! She was able to come out to the airport hotel for a handover of the image! 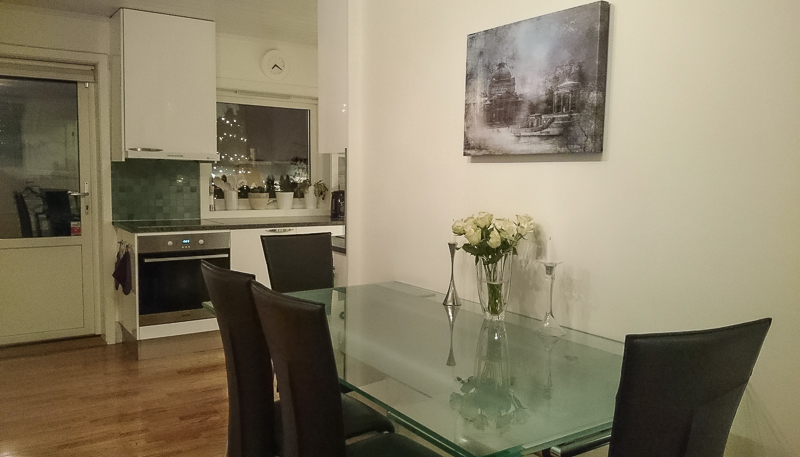 Mette went on to hang the image in her dining room. 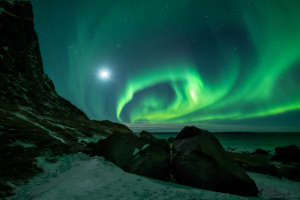 And I went on North to experience some pretty epic Northern Light displays. What was it like meeting someone who is so passionate about your work? I was very happy that someone from as far away as Norway had shown an interest in my image. I felt sufficiently strong about it to overcome any potential transport hurdles. It was very rewarding to finally meet Mette, who it turns out is a charming young woman. 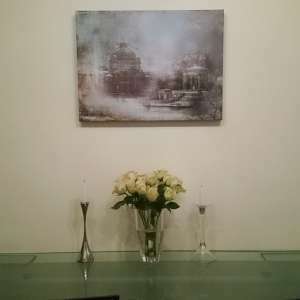 She is very passionate about bringing art into her home that matches her sense of style and enhances her living space. I absolutely love ArtBoja! The variety and quality of the many images for sale is just mind-blowing! The imagination and skills of the diverse set of artists behind it are superb, and the finishing of the printed products top of the line. I would highly recommend ArtBoja to any art lovers in search of the perfect piece of art for a particular location, or to round out their art collection. Or, if you’re looking for a way to print your own canvas fine art print, visit ArtisanHD’s Canvas Printing page. 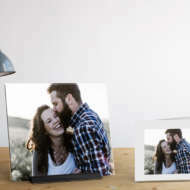 We also print on photo paper, acrylic, brushed aluminum, and more! Let us know what we can print for you. We’re currently offering 30% off our most popular photo paper, FujiFlex! Use code SOGREEN30 at checkout. Hurry, sale ends 3/19!